When we create Amazon instances, we will get key as .pem file. But for logging in to the instances directly using putty, we need the private key in .ppk format. For creating the private key in ppk, we need puttygen. Puttygen is available with the full bundle of putty. The steps are mentioned below. 2) Open the Puttygen and click on the top left option File and import the private key in .pem format. 3) Then it will be opened. 5) Click on save private key option and save it as .ppk format. Then in the left side part of putty, click on SSH and expand. There you will get a window with browse button. Load your private key file (.ppk) and press open. This is the method we usually use to login to unix cloud instances . 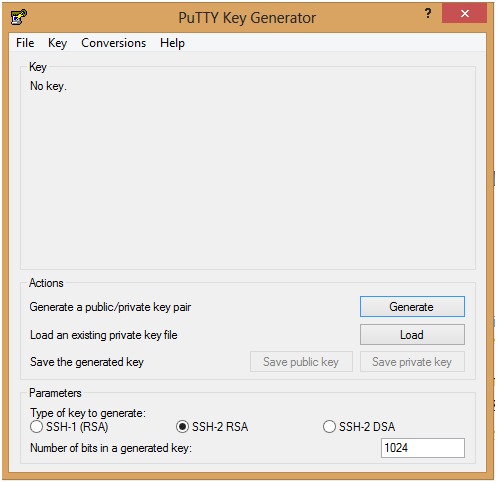 On a Windows machine, you can use PuttyGen to generate a public/private key pair. The private key is what you need on the client machine – for use with Putty for example. The public key goes to the host machine. 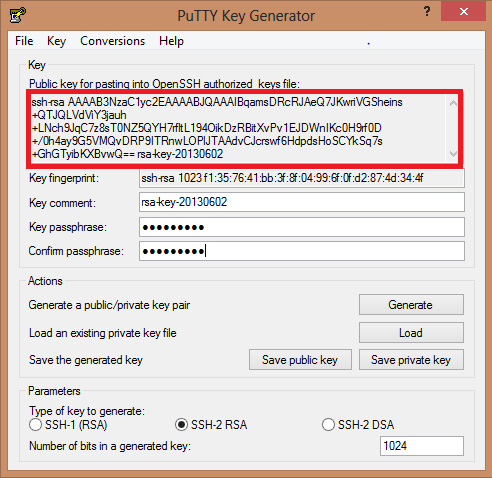 Open PuTTY Key Generator (puttygen.exe in the putty folder) which should look something like this. SSH-2 contains more features than SSH-1. SSH-1 has some design flaws which make it more vulnerable than SSH-2. Only choose SSH-1 if the server/client you want to connect to does not support SSH-2. The default SSH-2 RSA is probably better than SSH-2 DSA. The Number of bits in a genereted key sets the size of your key, and thus the security level. For SSH-2 RSA, it’s recommended to set this at a minimum of 2048. PuTTYGen defaults to 1024. Setting this to 4096 would provide an even stronger key, but is probably overkill for most uses. The result of the key generation is shown below. (in the box labelled Public key for pasting into OpenSSH authorized_keys file). The Key comment enables you to generate multiple keys and easily tell them apart. It’s general recommended to set this to username@hostname, where the username is the username used for login, and hostname is, as it says on the tin, the name of the host machine. For example, for a user ‘amal’ on domain ‘example.com’, set this to amal@example.com. The Key passphrase is an additional way to protect your private key, and is never transmitted over the internet. The strength of your key is not affected by the passphrase in any way. If you set one, you will be asked for it before any connection is made via SSH . Setting it might gain you a few extra moments if your key falls into the wrong hands, as the culprit tries to guess your passphrase. Obviously if your passphrase is weak, it rather defeats the purpose of having it. If you don’t want the passphrase key, you can leave it empty. Note that if your set a passphrase and forget it, there is no way to recover it. When you reload a previously saved private key (using the Load button), you will be asked for the passphrase if one is set. Here is what PuTTYGen looks like after editing the key comment and the passphrase. Now save your keys – one private and one public – using the Save private key and Save public key buttons respectively. You can save the public key in any format – *.txt is good. The private key is saved in PuTTY’s format – *.PPK. PuTTY will need this private key for authentication. The public key in the highlighted box is all in one line as expected by OpenSSH, and is in the correct format (unlike the version you just saved). If you are using OpenSSH, this is what you paste in your .ssh/authorized_keys file.